This is another apparent sea serpent sighting. Of course it may be a fake job laid on by local promoters, except all the conforming conditions exist. 1 Access to the sea is through a largish outlet river with ample rapids but certainly nothing likely to stop this creature. Access is short as is generally true elsewhere. 2 The lake is very deep as are all other examples. It is noteworthy that all suspect lakes are former glacier scours or at least appear to be so. Likely the creature prefers deep waters and extremely fresh water. It is noteworthy that most creditable lakes appear to have this type of cultural history. At the same time, there are thousands of non conforming lakes with no such history. As I have posted in the past, I suspect that these visits are for the purpose of laying a clutch of eggs. Thus the creature itself may not dally at all and its young will likely linger in the lake for some time before they head down stream. If this is a valid photo, then we also learn that the creature is really serpent slim and would match up to an anaconda. It is not unusual in terms of our expectations. Until this, the possibility of a pleiosaur was also argued, although I have long since narrowed it down to a serpent that lives in the deep, yet procreates in deep fresh water lakes. In fact this photo confirms my conjectures and expectations. It is not seen here, but the creature also sports a crest on its head which is most likely an external gill providing oxygen. This obviously inspired the Chinese dragon. Andreas Solvik said he was in “no doubt about it. We saw what we saw,” he told broadcaster NRK, Friday. There has been much talk over the years about whether there is a monster in the lake. At 514 metres (approximately 1,686 feet), Hornindalsvatnet is the deepest in Europe. 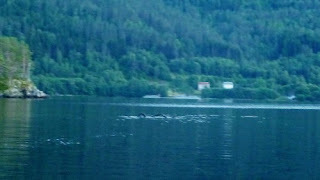 The men claimed they spotted the creature at 21:30 after seeing ripples in the water and do not believe a boat passing at the time caused the ripples. They took their boat to that area of the lake after allegedly seeing the serpent in the water the men took, but the creature was gone by the time they arrived, according to Mr Solvik. “However, there was nothing more to see when we got there, just ripples on the lake. There was nothing in the water then”. The men contacted the local newspaper, Fjordingen, and showed them the pictures they had taken of the creature. Its editor, Bengt Flaten, did not doubt the story the men gave. He said that the pictures clearly show something in the water and vouched for the man as he knows them. This is not the only story surrounding mysterious creatures in lakes. The most famous is the Loch Ness Monster in Scotland. Hornindalsvatnet is Norway's and Europe's deepest lake, officially measured to a depth of 514 metres (1,686 ft). Its surface is 53 metres (174 ft) above sea level, which means that its bottom is 461 metres (1,512 ft) below sea level. The village of Grodås lies at the eastern end of the lake in Hornindal and the village of Mogrenda is located on the western end of the lake in Eid. The E39 highway runs past Mogrenda and the lake. Since the age of the Vikings there have been tales of creatures from Norway's depths. Dragons are commonly known as Lindworms, monstrous serpents with or without hind legs though less likely to inhabit water. In Norway, tales of marine monsters appear vary throughout the country. The coasts of Norway are reportedly haunted by the terrifying Kraken. Sea serpents, with their glowing eyes and long manes, are said to live in varied locations. The Norwegian lake Seljordsvatn is famous for its claimed inhabitant, a serpent known as Selma. More human but equally terrifying is the Draug (Ghost of the Sea), a skeleton dressed in oilskins and sou’wester, sailing in a halfboat. If fishermen or sailors see him, they know that they’re almost certain to drown. Some times he’ll go ashore and sit in newly built boats. People sitting where the draug has been seated are bound to drown. Before the ship goes down, the halfboat will turn up and sail along with the ship and lead it into dangerous waters. Then there is the Nøkken, a water being, found in lakes and rivers. It's a shapeshifter and can turn up as a handsome young man playing the fiddle or the harp so beautifully that people go into the water without recognising that they can’t swim, and then they drown. Other times he shows himself as a white horse, walking invitingly near the river - or lakeside, but if you try to ride this horse, he will jump directly to the bottom of the water with you. He can also be seen as a ghastly head with glowing eyes, easily taken for a small island with red lights.